We’re back to our Edge series of ideas scientists wish more people knew about. Today is John C. Mather and the Big Bang. Mather isn’t pleased with popular conceptions. What astronomers actually have observed is that distant galaxies all appear to be receding from us, with a speed roughly proportional to their distance…[W]e can get the approximate age of the universe by dividing the distance by the speed; the current value is around 14 billion years. The second and more striking conclusion is that there is no center of this expansion, even though we seem to be at the center. We can imagine what an astronomer would see living in another distant galaxy, and she would also conclude that the universe appears to be receding from her own location. The upshot is that there is no sign of a center of the universe…A third conclusion is that there is no sign of an edge of the universe, no place where we run out of either matter or space…The actual universe appears to be infinite now, and if so it has probably always been infinite. 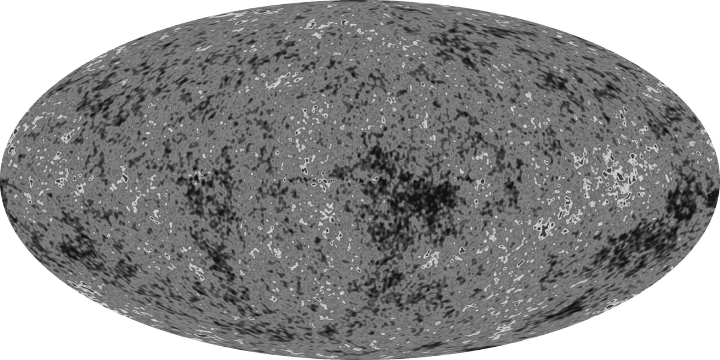 It’s often said that the whole universe we can now observe was once compressed into a volume the size of a golf ball, but we should imagine that the golf ball is only a tiny piece of a universe that was infinite even then. The unending infinite universe is expanding into itself. Consider the idea of the multiverse coupled with eternal inflation. Inflation helped propel the “big bang”, that initial golf ball, into the roomy and expanding universe we see around us today. The idea of eternal inflation is that these golf balls are everywhere, popping into existence and swelling into local universes in their own right. There isn’t any way to do justice to all the views and variations of multiverses in this short post, so I will comment on only one aspect, Max Tegmark’s second Level of multiverses. These are universes which have different parameters, or different physical constants. The first Level of multiverse is the same as ours, run by the same physics, but each has different initial conditions from whatever conditions existed at the start of ours. How these initial conditions are chosen and why ours got the values it did, except by reference to anthropic principles, is never specified—for the very good reason that nobody knows anything about how the initial conditions were caused, except by some hand-waving about quantum mechanics. Nobody hows how any quantum mechanic result is specified. We do not know what causes QM events, so we cannot know why our universe had the initial conditions it did. The multiverse is another hypothesis to solve the peculiarities of quantum mechanics, or rather move them back one level so they seem to disappear. Eternal inflation comes from the relativity side of things. Now in this universe (the one out your window), there exists certain physical reactions which physicists have described using parameterized equations. The parameters are not known but estimated; they are hypothetical, meaning they might be wrong. That is, it might be that there are no free parameters and what physicists have proposed equations which are mere estimations of the universe’s true forces. It might be, for instance, that the descriptions of motion and change are entirely deducible from first principles (such as the principle of non-contradiction). But suppose arguendo the parameterized equations are correct. The values of the parameters—as do the equations themselves!—have to come from somewhere. They must be chosen; a causal mechanism must exist which “assigns” the values (and causes the equations). It might appear that it is a solution to quantum ambiguity to say that a different universe is created which takes each possible value of parameters. Since parameters are assumed (there is no first-principles proof) to be continuous, the number of other universes is thus infinite, with the power of the continuum. That’s a lot of universes! How? How are the parameters decided? Decided as in caused to be? The author of that article says what is often said, “The reason many physicists love the many worlds idea is that it explains away all the strange paradoxes of quantum mechanics.” It does not. Neither Many Worlds or multiverses does away with the peculiarities of QM: they simply push them back one or more level, so that they seem to go away. Re-read the critique of Many Worlds to see why this was so there. Here, in multiverses, there is no solution to QM by saying infinite number of universes are created with different parameterizations, because there is nothing that says which parameterization went where, and how QM knew about all those parameterizations, and how it had the causal power to make the distinctions. It is true that in this universe we can say, “We’re just one of many, so QM is not strange.” But when pictured as a whole, QM is still strange. But Susskind and Bousso say there is a special formulation of the universe in which [experiments about other universes are] possible. This is known as the supersymmetric multiverse with vanishing cosmological constant. If the universe takes this form, then it is possible to carry out an infinite number of experiments within the causal horizon of each other. Now here’s the key point: this is exactly what happens in the many worlds interpretation. At each instant in time, an infinite (or very large) number of experiments take place within the causal horizon of each other. As observers, we are capable of seeing the outcome of any of these experiments but we actually follow only one. Bousso and Susskind argue that since the many worlds interpretation is possible only in their supersymmetric multiverse, they must be equivalent. “We argue that the global multiverse is a representation of the many-worlds in a single geometry,” they say. But what this idea lacks is a testable prediction that would help physicists distinguish it experimentally from other theories of the universe. And without this crucial element, the multiverse interpretation of quantum mechanics is little more than philosophy. That may not worry too many physicists, since few of the other interpretations of quantum mechanics have testable predictions either (that’s why they’re called interpretations). Again, you’ll have to review, but in Many Worlds the problem of how the splits happen, and how they appear to require infinite power do not disappear. And it is still the case that we can only follow one of Many Worlds at a time: the one we’re in (and recall you cannot split because you are part intellect and will and these are not made of splittable stuff). This is why there aren’t and can’t be any testable predictions. This makes the duo’s idea not “little more” than philosphy, but precisely philosophy. And given the spiritual nature of our makeup, incomplete or wrong philosophy. Nobody who’s ever known anyone before and after a major stroke(s) [or comparable brain injuries] can believe that. Ken, by split, Briggs obviously means two parts existing simultaneously. Your example is for two time points. The intellect was not split, but tragically impaired. My friend Paul is the same person he was before his stroke. He is not now twins. It is amazing what many areas of science claim to “know”. It takes as much faith as any religion to believe in them. It is indeed philosophy labelled as science. Theoretical Science (read as “NEVER questionable science”) is built like a circumstantial law case: Find perp, build evidence to make it convincing he is the one, toss in statements like “best explanation for the facts in evidence”, hope no one notices there may be facts outside of those in evidence and pronounce the perp guilty beyond a shadow of a doubt. No appeal is allowed without objections that the “facts” proved the case. No DNA evidence is ever allowed because it might free the perp. The perp is guilty because Theoretical Science is never, never wrong. Ken: The answer to your objection is not any more testable than the rest of this stuff, but the answer is the person is still as they were before the stroke, the physical material that allowed that person to be “themselves” is damaged and the true person can no longer be seen by others. It’s impossible to directly test, though kids with autism using computers to communicate lend some credence to the idea. If there was a way to restore the physical, the person would be precisely like they were before. At least that’s the argument. It’s as valid as any of the theoretical physics stuff that can’t be tested. Was it designed to “prove” something, sure. But so is a lot of Theoretical Science. People tend believe what they want to be true. (Yes, even you.) If it cannot be tested, so much the better. The belief stands without challenge. With a bit of preceding & subsequent stage-setting regarding MODELS — for that’s what equations are — he’s off & running … treating all that follows as if that’s all that follows … into a kluge of mathematically derived scenarios into their philosophical implications. Why would anyone do that??? We all know enough to know that Newtonian math works great at some levels (like modeling roller-coasters), but breaks down at extremes (e.g. atomic levels). Quantum mechanics does well at modeling some of the things Newtonian can’t address. And so on. We’ve read here, ad nauseum, about the flaws of very complicated global warming models…understanding they may be good for some things, but only to a point beyond which it is reckless to apply them. Even the mathematically illiterate know enough to know that applying Newtonian math to particles at the sub-atomic level, or, applying quantum mechanics to design a strong enough table leg are wrong. And yet, with all that rigor and understanding, when it comes to something where nobody really knows much of anything — the “Big Bang” (whatever that was, or wasn’t…and the implications therefrom) — some of us are all too happy to take a single crude mathematical model, knowing that whichever we pick among the competing mutually exclusive crude models on that topic, it invariably must be incomplete in some fundamental and unknown ways, and then, anyway, we’ll blindly extrapolate them from here to, literally, the extremes of infinity? “Bah humbug,” I say. Fat, Drunk and Stupid is no way to go thru life (see: http://www.youtube.com/watch?v=mkoPq5AOCOA), and, piling philosophy on a heap of wildly extrapolated scenarios concocted from a mountain of math that’s replete with ignorance is pointless as well. Over here we’ve got a Constitution and some derived laws, most with precedents that define their meaning very clearly and the rest which seem straightforward with the basic meaning agreed to by pretty much all, and a recent Presidential Executive Order (that in practical terms for most of us has absolutely no effect on anything we do or might do) that that nobody in the press cannot seem to explain factually, and which numerous pundits, lawyers, and judges have evaluated differently. This will be argued about for months, probably. Maybe more. Just to determine if an action is or isn’t allowable. We can’t even do that without a fuss….and some think we can build a math model on a few facts, some theory, and a heap of ignorance and from that extrapolate the meaning of the universe. Get real…who are you trying to kid? Briggs chooses to believe that intellect (“will” is a manifestation of intellect) is non-physical/spiritual as Aquinas makes clear his belief. That view is provably false. Stroke victims — post-stroke their intellect IS changed, sometimes in very curious ways, and commonly in ways that demonstrate a loss of particular intellectual capabilities. Thus, either the intellect is a manifestation of brain matter as evidenced by the loss of parts of intellect when certain brain matter is destroyed (proving Aquinas & Briggs’ acceptance of Aquinas view wrong), or, when the stroke occurs and certain intellectual capacity is lost in the material human, then intellect IS “split” (which Briggs says, today, cannot happen). Even conceding those questions calls into question core tenets of the underlying theological philosophy. So, such things are ignored…and…we observe resistance in the form of themes such as anti-science views (“scientism”), which serve to help one retain wrong beliefs via the familiar tactic (here) of rebutting sloppy science/pseudoscience, then extrapolating that rebuttal more broadly to all science. I have a pet theory too: some physicists say this kind of stuff because it sells books about quantum physics to the general public. They want to emulate Hawkins, but without his physical condition. Ken, changed (post-stroke) is not split. There is no time factor in split. Split is a condition, not a process. The matter is definitional, not philosophical. I recall a “bubble” idea that imagines universes as sort of bubbles all pushing against one another, blowing one into the other, popping from compaction, etc. I’m certainly not sold on anything, but I’d buy something like that before these dimensional multiverse theories. Brain function and peripheral neural function do not necessarily behave as predicted given the ‘mapping’ of the brain and the area of trauma. There is always a lot of uncertainty. All anatomy is not identical, Nerve tissue has immense tolerance to trauma in some cases and is apparently fragile in other instances. This is not always explained in terms of structure, i.e. shape. The other point to remember is that when a nerve is cut , compressed or stretched or otherwise insulted, (even when function alters predictably with respect to intellect in this case) function is, where healing occurs, restored suggesting that there was not splitting. I liken it to an astronaut migrating into the remaining functioning part of the ship (not fixed on that, it’s just a thought). That is just one way to consider but the possibilities are large when we still can’t explain or predict every patient’s case. If the brain were like the wiring on a computer there would be no mystery but it isn’t. The brain is coupled with the rest of the nervous system and this is vital to remember. The intellect is not really understood in a way that really captures what it is then to me this is also where mistakes of conclusions might be made. As long as the definition is precisely defined then that in itself is a sort of splitting all be it for consideration. My objection is always really about definition of intellect. That way be dragons! I wonder where the sound and pictures go when my television is impaired by an electromagnetic disturbance. Good onya Sheri! I substantially agree that these conjectures are but an attempt to convince the exceedingly gullible that things that are demonstrably impossible according well known Natural Laws are certain facts if they are “projected” into an entirely imaginary “situation” so remote that it cannot be subjected to any kind of scrutiny or examination. I disagree, though, that fantastic daydreams are “philosophy” opposed to “science”. Real philosophy is science. It is the rules of engagement for any kind of investigation, knowledge and understanding of reality. Fantastic daydreams, fanciful conjectures, other kinds of magic, do not come within a bull’s roar of being philosophy (i.e. science). They are merely an essentially Voodoo kind of magic sleight-of-mind trick designed to beguile and deceive the credulous. Strict (philosophical) materialism (regarding, e.g. intellect and will) is pretty hard to prove, though; it’s not ‘just obvious’. For example, as one of Matt’s favorites, philosopher David Stove, pointed out, it wasn’t that long ago (say around 1900) when all respectable philosophers were idealists, not materialists. The numerical preponderance among academic philosophers is now in favor of materialism, but thoroughgoing materialism is still not ‘just obvious’, as a quick look at some recent academic summaries of philosophical materialism can demonstrate. And one of the practical disadvantages to positing no metaphysical component at all to human intellect and will is that it automatically risks collapsing all questions of human identity into the calculus of politics; that is, of power: who – whom. Ken’s example of a stroke victim is salient. Generating an actual reason why someone so powerless should not be regarded as disposable is less easy for the strict materialist, but such reasons follow from prior premises for those who follow Aquinas, in which the integrity of the person is neither gainsaid nor corrupted by their particular physical state at a given time, nor by social opinion, convention, or diktat. Put differently, men do various things to each other; but is whether they can get away with it the only standard by which they can be judged? Whatever one may think of classic Thomism (and I am not a huge fan), it does open out to more than “the will of the stronger” as the definition of justice. All this, of course, point to classic topics in philosophy; I’m not trying to solve them here. But one final aside: applying the name ‘Person’ to each of the members of the Blessed Trinity (beginning in the 3rd-4th-5th century) was a staggering advance whose implications are woefully undeveloped even now. The comment above was really more relevant to what Ken said about the intellect being splittable. as matter is. The problem lies in the understanding and definition of what intellect actually is which is, and I dread to say it, circular.. I will contend that philosophy (indeed, all science) cannot be entirely materialistic. The very intellect that makes science possible is as metaphysical as the processes required to observe, know, understand, induce, deduce, are as metaphysical as the science of logic. The brain and all its physical attachments that connect the metaphysical mind to the world of sense are not the metaphysical intellect and will even though a defect in those physical bits can severely impact the “information” to and from the metaphysical mind. However, even though physical defects like blindness, deaf, missing limbs, chemical or genetic disorders and deficiencies may affect the connection between the physical and metaphysical, the underlying “personness” remains in potential albeit relatively developed or undeveloped. The failure of the physics is not the end of the road. This and this should interest the splitters. It’s a common misconception that Everett proposed a “Many Worlds” interpretation, but I recall reading somewhere (can’t find the reference now), that he was quite upset about DeWitt’s interpretation. His (Everett’s) notion was more akin to the “Many Minds” interpretation of quantum theory.